PHOENIX--(BUSINESS WIRE)--The start of a new year means new beginnings, resolutions and goals. As people everywhere make to-do lists to help enrich and better their lives, these lists should include our pets too, says Lisa Darling, DVM, on-staff veterinarian for services at PetSmart. PetSmart has launched its New Year, New You Pet Collection to provide pet parents with a variety of products to help pets meet health and wellness goals, including active toys, weight management dog and cat food formulas, healthy natural treats, oral health and at-home grooming tools, in addition to harnesses, collars, leashes and winter outdoor apparel. You can view the entire collection on www.PetSmart.com/NewYearNewYou. #1. Check Your Pet’s Food. Pets at varying ages have different nutrient requirements, so consider assessing your pet’s food and adjust accordingly. For example, if your dog is overweight, certain weight management pet food formulas can help a pet lose weight, along with exercise. Consult your veterinarian on any changes to your pet’s food, and always accurately measure your pet’s food vs. eyeballing. #2. Stop all Table Scraps. We might think we are “treating” our pet when we give them human food from our plates, but we are likely doing more harm than good. Research natural, healthy pet treats, like the Only Natural Pet® Freeze-Dried Chicken Bites, and get an on-trend treat jar for your kitchen or mudroom like this ceramic pet treat jar from ED Ellen DeGeneres. Make treating your pets a healthy activity. #3. Start a New Activity. With so many pet-friendly venues and activities, it’s easier than ever to incorporate your pet into a new activity like a hike, Doga (dog yoga) or paddle boarding. Research pet-friendly meet-up groups for ideas and events in your area. Whatever activity you choose, try to do it on a regular schedule in the New Year. It’s a great way to bond, get out of the house and reap the benefits of physical activity. #4. Get Some New Toys. 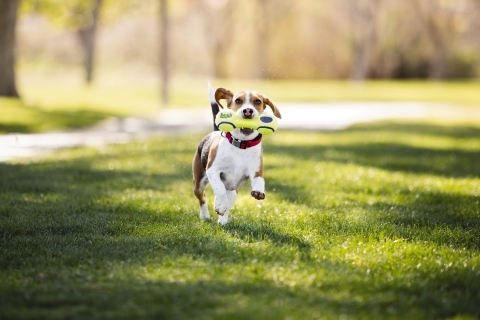 Freshen up your pet’s toy collection with new items that stimulate their brain or promote activities like fetch. Studies show mental stimulation can likely help reduce cognitive deterioration in aging animals. Items like the Trixie Chess Game Toy or this amphibious fetch toy are a great way to get your dog moving. For cats, this Whisker City Catnip Cyclone or Peek-a-Prize Toy Box are great options too. #5. Teach a New Trick. Similar to toys, teaching pets a new trick can also be stimulating. Sign up for pet training courses like PetSmart’s Trick Training, where dogs can learn fun and playful tricks such as crawling, taking a bow, high fiving and rolling over. Additionally, for those that want to get involved in their community with their dog, PetSmart’s Dog Therapy Training prepares pet parents and their dogs for Therapy Dog evaluation, which is conducted by third parties dedicated to registering therapy pets. Once officially registered, a therapy dog and pet parent can work together to give back in their community by delivering emotional support at hospitals, schools, community centers and other local programs. #6. Make a Play Date. Get social in the New Year! Consider setting up a pet play date with a friend and their pet at a nearby park. Doggie Day Camp is a great way to socialize pets and meet new pet parents as well. Assess your dog’s willingness to mix with other dogs before heading to a play date. If your dog is tolerant of other dogs, has good recall skills and focuses on you when you engage him or her, you and your pup are likely ready for social settings. #7. Groom Your Pet. It is recommended to professionally groom your pet every four to six weeks. Between salon appointments, use at-home grooming tools such as a cat or dog-specific tooth brush and specially formulated tooth paste, a nice rubber brush to help de-shed and invigorate the skin and coat, ear cleaner and cotton balls to gently cleanse the ears, and wipes for cleaning around the face, mouth and eyes. #8. Check Vaccinations. Make sure your pet is up-to-date on vaccinations. In 2017 there was a resurgence and spread of many infectious diseases across the U.S. Many of these diseases are preventable through vaccination, including Canine Influenza, Leptospirosis (which can be transmitted to people) and Lyme. The cost of prevention is far less than the cost of the treatment, and helps to keep pets healthy and free from disease. #9. Prevent Parasites. Help protect pets and people from fleas, ticks and intestinal worms, which can cause serious diseases with easy-to-use solutions. Both PetSmart and PetSmart’s online pharmacy offer many effective and safe products from which to choose; however, there is not always an all-in-one single product that is effective for heartworm disease, fleas, ticks, as well as intestinal parasites. Pet parents should always talk to their veterinarian to learn which are the most common parasites in their locale and the safe combinations of products to administer to their pets. An example of treatments for cats may be an integrated program such as the Seresto collar with Advantage Multi product, and for dogs a broad-spectrum combination like the Interceptor Plus along with Nexgard. #10. Make 2018 Stress-Free. Eliminating or reducing stress in a pet’s life can be an important focus to enhanced health and wellness. There are many calming products that help reduce stress and assist pets in coping with routine and non-routine activities. PetSmart offers a number of calming solutions such as the Thundershirt, which calms dogs with consistent pressure on their body like a soothing hug; collars and diffusers that release pheromones similar to what female dogs release when nursing their new puppies; as well as Licks Zen and other chews with natural supplements that deliver calming effects. PetSmart, Inc. is the largest specialty pet retailer of services and solutions for the lifetime needs of pets. At PetSmart, we love pets, and we believe pets make us better people. Every day with every connection, PetSmart’s passionate associates help bring pet parents closer to their pets so they, together, can live more fulfilled lives. This vision impacts everything we do for our customers, the way we support our associates and how we give back to our communities. We employ approximately 55,000 associates, operate 1,600 pet stores in the United States, Canada and Puerto Rico, as well as more than 200 in-store PetSmart® PetsHotel® dog and cat boarding facilities. PetSmart provides a broad range of competitively priced pet food and products, as well as pet-focused services such as dog training, pet grooming, pet boarding, PetSmart™ Doggie Day Camp™ and pet adoption. PetSmart, together with non-profits PetSmart Charities® and PetSmart Charities® of Canada, invite more than 3,500 animal welfare organizations to bring adoptable pets into stores so they have the best chance possible of finding a forever home. Through this in-store adoption program and other signature events, PetSmart has facilitated more than 7.6 million adoptions – more than any other brick-and-mortar organization. The company’s portfolio of digital resources for pet parents includes PetSmart.com, petMD.com, Pawculture.com, AllPaws, an online pet adoption platform that helps potential pet parents find the perfect pet to adopt based on their home, family and lifestyle, as well as BlogPaws, the world’s first pet blogger and influencer network. Through these digital platforms, PetSmart offers the most comprehensive online pet supplies and pet care information in the U.S. In May 2017, PetSmart acquired Chewy.com, a leading online retailer of pet food and products in the U.S., which operates as an independent subsidiary. Turn your passion for pets into a career you’ll love! Visit careers.petsmart.com to learn more about corporate, retail store, and Distribution Center opportunities.